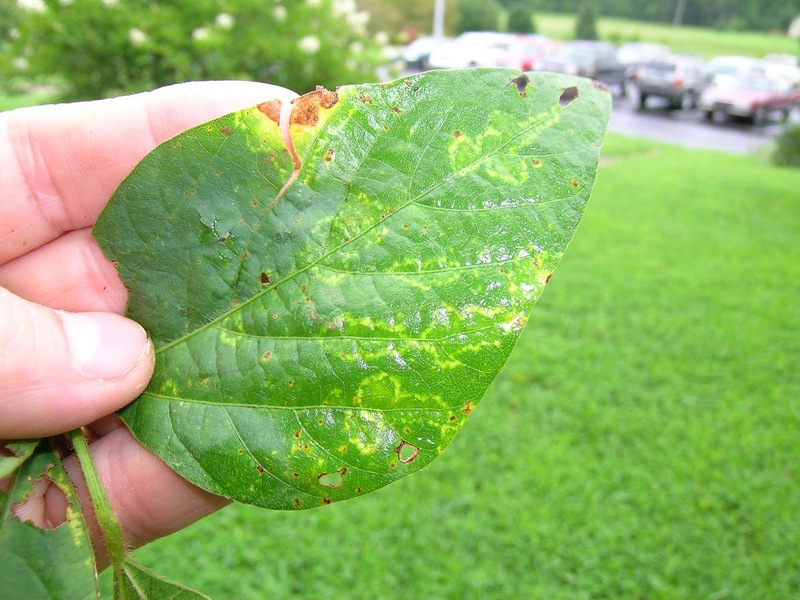 A new virus disease of soybean, Soybean Vein Necrotic associated Virus (SVNaV), is fairly widespread in soybeans in west Kentucky at this time. This virus disease is thought to be transmitted to soybean by thrips. We have seen this disease at low levels in Kentucky for the last 15 years, but it has only recently been named and partially characterized. Thus far, the disease has been confirmed in AR, DE, KY, KS, IL, MS, MO, MS, NY, PA, TN, and VA. Although the SVNaV is easy to find in many fields, I do not think the disease is severe enough in any field to result in measurable yield losses. In fact, I am not aware of any instances in the U.S. where measurable yield losses have been attributed to SVNaV. It is, however, an emerging disease that merits additional study and monitoring. Look for leaves with faint oak leaf patterns that turn yellow and then brown over the course of 2-3 weeks. Brown lesions are commonly colonized by secondary fungi, especially Cercospora spp. Corn plants in many fields are turning red and that is not a good sign. The red color is coming from a build-up of sugar in the leaves and stalks. The build-up of sugar is a result of too few kernels being developed on the ears. poor or no seed development. During the process of plant growth and development, a plant produces sugar through photosynthesis. That sugar is used to build new plant parts, to fuel growth and development, and to help produce seeds. Each plant will produce the sugar necessary for expected yields. 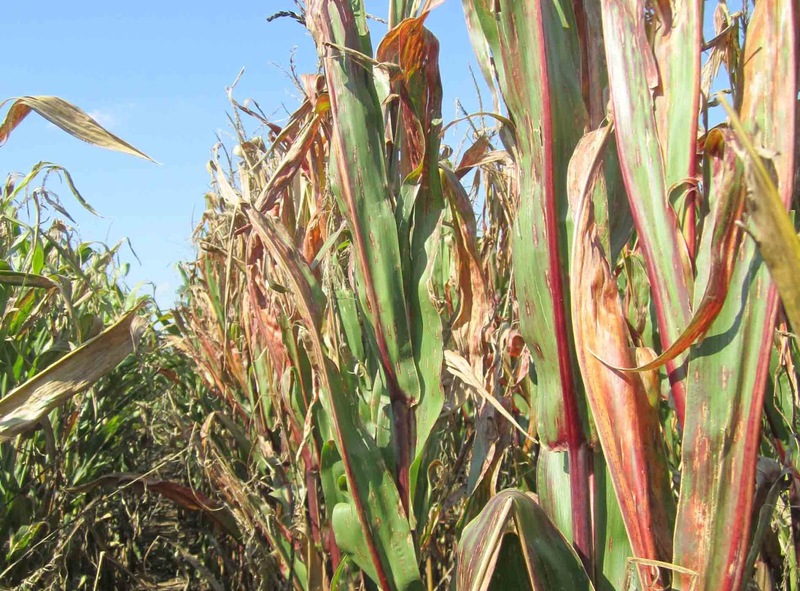 When those expected yields don't happen, the sugars remain in the leaves and stalks and, eventually, turn the plants red to reddish-purple. To paraphrase a poor pun from one of my colleagues, "red corn plants are a red flag that seed development has gone wrong." Feeding of one or several “armyworm” species appears to be on the increase. I cannot be completely sure which species are causing the damage, and it is likely that two species, the armyworm also know as True armyworm and the fall armyworm are the most likely culprits. Fall armyworm moth captures in the IPM pheromone baited traps at Princeton, KY have skyrocketed in the last two weeks, going from 0 to 131 and currently to 550 moths captured in the trap week ending 9/16/12. This problem was reported in TN, AR & MS last week and recently in MO. of what we pay in the grocery stores for our food. Fall Armyworm Moth Flight Increases, worms sited! Capture of fall armyworm (FAW) moths in UK-IPM pheromone-baited traps has increased substantially over the last week. Until recently, there had been no FAW moths captured at the UK-REC in Princeton (Caldwell Co.) and only small numbers in Cam Kenimer’s trap line in Fulton Co., KY. In the trap week ending 9 Aug. 12, the capture increased from zero to 131 moths / week at the UK-REC, though the Fulton Co. trap counts remain low. It is difficult to know what the increase at the REC might mean, however, a producer in Caldwell Co. (the county in which the REC is located) has seen a small number of FAW crossing a road. Additionally, reports from counties further east and south report FAW infestations in pastures (they must have gotten some rain!!!). Add to this reports from our colleagues in states to the south, indicating increases in FAW activity in areas that have received recent rains; and I think this adds up to checking to make sure they are not present in your fields. At this time of year FAW are primarily a risk to soybeans and pasture / grass hay fields. They would also attack corn, but we are too far along for this to happen in our major corn growing area. Nevertheless, this insect can be quite voracious so producers of soybean and pasture / grass hay are encouraged to check your fields to look for this critter. FAW is a migratory pest in KY and is only an occasional pest of soybeans; but it can cause serious damage if infestations are large. 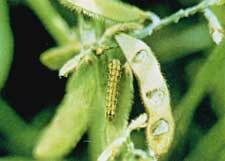 Soybean is not a preferred host crop, but it may be infested especially in years when grass crops are not available. Given our unprecedented drought that is certainly the case this year. This is primarily a defoliating pest but can feed on pods as well. Newly hatched FAW are white with a black head, but the body darkens as it grows. Full-grown larvae are up to 1 1/4“ long, have black bumps, and may be light tan to dark green. The black head will have a distinct inverted “Y”. Thresholds for this pest in soybean are not well established in KY. Like corn earworm, if sampling in wide row beans with a 3’ shake cloth, the threshold would be an average of 2 worms per row-foot. If sweeping narrow rows with a 15” sweep net, an average of 9 larvae per 25 sweeps would indicate a need for control. Thresholds for FAW in pastures / grass hay fields are also not established. Clearly the insect can do great damage in some situations. In states further to the south of us 4-6 or 5-7 worms per square foot are used as the economic threshold. Though the season would be earlier and the grass variety different, that is probably as good as starting place as any. Corn Earworm Moth Counts Increasing Significantly. Capture of corn earworm moths in IPM pheromone-baited traps in Princeton, (Caldwell Co.) KY and in Fulton Co. KY have taken a significant increase over the past two to three weeks. This follows on the heels of warnings of corn earworm problems in states south of KY. These insects are likely coming out of corn that is maturing and will be looking for another host, probably soybean on which to lay their eggs. The moths are not the damaging stage, but in a couple of weeks, their offspring will appear in the form of caterpillars. The first really big jump in capture was in Fulton Co. on July 22, but that capture is only about 1/3 of the most recent capture. Using July 22 as a starting date, small larvae to medium larvae could already be present. Larvae from moths caught over the last couple of weeks should come in a steady stream. With corn maturing and being harvested in most western KY areas, soybeans are the most likely field crop target for this pest. Of course these counts cannot predict what will happen in a particular field. Conversely, the captures are certainly above the rolling five year average so represent an increased level of risk. Areas in the south and west will be impacted sooner and areas in the north and east somewhat later. You should be scouting your soybeans NOW! Newly hatched CEW larvae are translucent yellowish-white, but larger larvae have considerable color variation. When feeding on soybeans they tend to be light reddish- brown and large larvae are often green, yellowish or black with distinct cream colored bands running their length and their heads are usually orange. CEW can consume foliage, flowers and pods of both full-season and double-crop soybeans. Economic threshold in wide row (30”) beans sampled using the 3’ shake-cloth method would be two worms per row foot. If sweeping (15” sweep net) narrow row beans the threshold would be an average of 9 caterpillars per 25 sweeps.